450 min. AMC. Cast: Anson Mount, Colm Meaney, Dominique McElligott, Common, Tom Noonan, Wes Studi, Ted Levine. No question: without Deadwood, there wouldn't be a Hell on Wheels. And Hell on Wheels, it must be said, is no Deadwood. Still, AMC's drama series about the people surrounding the 1865 building of the transcontinental railroad proves surprisingly compelling on its own terms—surprising for a show that has had little success getting respect or buzz in the shadow of HBO's beloved western. One reason Hell on Wheels has had some trouble getting a foothold in pop culture is that it lacks a breakout performance like that of Jon Hamm (Mad Men) or Bryan Cranston (Breaking Bad). Nevertheless, Anson Mount broods effectively as Cullen Bohannon, a former Confederate soldier now employed as boss of a "cut crew" that makes way for the laying of track. Common does much the same as Elam, a recently freed slave on the crew, and Colm Meaney (Star Trek: Deep Space Nine) gives ruthless entrepeneur Thomas "Doc" Durant—the only character directly based on a real-life figure—a certain panache between schemes and threats. Rounding out the main cast are Dominique McElligott as savvy Lily Bell, making her way on the frontier after losing her husband; Tom Noonan as sinner seeking redemption Reverend Cole; Eddie Spears as Joseph Black Moon, a Cheyenne man who works with Cole; and Ben Esler and Phil Burke as small-time businessmen the McGinnes brothers. They all traffic in Hell on Wheels, the mobile camptown that follows the progress of the railroad. Durant must complete forty miles of track, on deadline, to collect a government subsidy of $16,000 a mile, and to do so, he needs the cooperation of Lily Bell (who also strikes him as a potential wife) and the efficiency of Bohannon. Durant also makes use of a tall, cadaverous Norwegian thug misnicknamed "The Swede" (a wonderfully wicked Christopher Heyerdahl) who becomes fast enemies with Bohannon. The Civil War remains an open wound, and Bohannon lives to avenge the murders of his wife and child by Union soldiers (one of whom fearfully puts it, "We opened a dark door, and the Devil stepped in"). Having already killed most of the soldiers, Bohannon is wanted by the law, but he's more concerned with finding and slaying the last man standing. The series offers solid production value (whether it be the grimy camp or Alberta's astonishing vistas) and a couple of strong guest turns, from Wes Studi (Dances With Wolves) and Ted Levine (Monk). The period affords its own interesting sights, from the burgeoning railroad to the movements of the Cheyenne Dog Soldiers to the Magic Lantern show run by the McGinnes boys. The violent and, at times, downright gory first season's outlay of ten episodes makes it to Durant's deadline while leaving open the question of Bohannon's fate in the wake of a traumatizing incident. This sets the stage for a confirmed second season of Hell on Wheels on AMC, and a chance at building buzz to match its satisfying ratings performance. 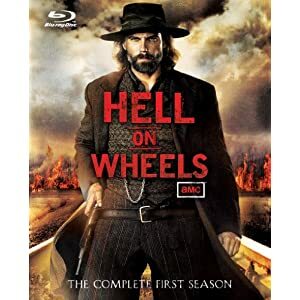 Entertainment One saddles up for Hell on Wheels: The Complete First Season, and the hi-def picture and sound quality excel. The picture dazzles with crystal clarity: blue skies pop, though color is mostly on the subtler side given the dirty, Deadwood-esque period evocation. Sound comes in both lossless DTS-HD Master Audio 5.1 mixes and lossy Dolby Digital 5.1 mixes. Obviously audiophiles will opt for the former, which impresses with full-bodied music cues and potent effects, nicely spread through the surround field while never sacrificing pinpoint clarity of dialogue. Other than a lack of commentary tracks, the bonus features qualify as comprehensive. first up is "Recreating the Past: The Making of Hell on Wheels" (16:54, HD), with set footage and interviews with director/executive producer David Von Ancken, production designer John Blackie, locations manager Edsel Hilchie, head greens Tom Yaremko, art director Bill Ives, construction coordinator Alf Arndt, and set decorator Paul Healy. Blackie returns in the self-explanatory "Crashing a Train: From Concept to Camera" (3:25, HD). "Making-of Featurettes" (33:26 with "Play All" option, HD) include "About Hell on Wheels," "The Guns," "The Wardrobe," "The Meaning of the Railroad," "Building the Train," "Locations and Sets" and "Dirty Medicine." These promotional mini-docs feature behind-the-scenes footage and interviews with Anson Mount, executive producers Tony & Joe Gayton, Von Ancken, executive producer Jeremy Gold, Healy, Colm Meaney, Common, Dominique McElligott, armourer/props Brian Kent, property master Ken Willis, costume designer Wendy Partridge, Blackie, Gerald Auger, Wes Studi, Ives, special effects coordinator Jason Paradis, Eddie Spears, Robert Moloney, director of photography Marvin Rush. "Character Featurettes" (12:56 with "Play All" option, HD) include "Cullen Bohannon" (Mount), "Elam Ferguson" (Common), "Thomas Durant" (Meaney), "Lily Bell" (McElligott), "The McGiness Brothers" Sean (Ben Esler) and Mickey (Philip Burke), "Pawnee Killer" (Auger), "Joseph Black Moon" (Spears), with each actor speaking for his or her character. "Episode Featurettes" (52:41 with "Play All" option, HD) cover "Pilot," "Immoral Mathematics," "A New Birth of Freedom," "Jamais Je Ne T'Oublierai," "Bread and Circuses," "Pride, Pomp, and Circumstance," "Revelations," "Derailed," "Timshel," and "God of Chaos" with actors Mount, Meaney, Common, McElligott, Moloney, Christopher Heyerdahl, Esler, Burke, Spears, Auger, Robin McLeavy providing character analysis. "Behind-the-Scenes Footage" (24:36, HD) collects raw B-roll footage from the production, and last up is a "Trailer" (1:28, HD). All site content © 2000-2019 Peter Canavese. Page generated at 04/24/2019 07:28:11AM.